This week, arriving back from Bali early on Tuesday morning after a flight through the night and little sleep, meant an unproductive morning. That afternoon I had the amazing opportunity to meet Heston Blumenthal and watch a private rehearsal for his live show in Sydney that night thanks to one of my clients. If you don’t know who he is, copy and paste his name to Google and have fun watching his amazing food creations. What an awesome experience that was! His knowledge and love for food is endless and I took some of that inspiration into this week’s meal. While it entered late in the play his influence was prolific throughout the week- so much so that I couldn’t help trying for a tip for the whole recipe from the man himself, via my client. In the end perhaps a ridiculously hectic show schedule held him back, as I’m sure a celebrity appearance on meatmikecampbell.com can only be at the top of his ‘bucket list’. Next time I suppose. So the question then is- What did I cook this week? Well, it’s something that is often thought of as offal; however, it is most definitely not. It was Beef Cheek, which is a fleshy part of the cattle, in fact it is its most used muscle, what with all the cud chewing. From the outset I was confused whether or not this will count as beef for my 52 meats, and was subsequently rather dejected at the thought of that ending up as the case. However, seeing as I’m the boss of this, I decided on no hard and fast rules, for now. Now the tricky thing with beef cheeks (just like the calf muscles of a ballet dancer I’d imagine) is that because they are such a highly used muscle it means they need to be cooked for a long time otherwise they will be tough. I picked these ones up at 4pm on Friday afternoon and the prospect of eating around 10pm that night wasn’t a favourable one, so I devised a plan to start early on Saturday and cook through the morning making this week’s meat a lunch time feast. I again resorted to an online search for a recipe, only knowing that I wanted to use some of my own lamb stock within the recipe. 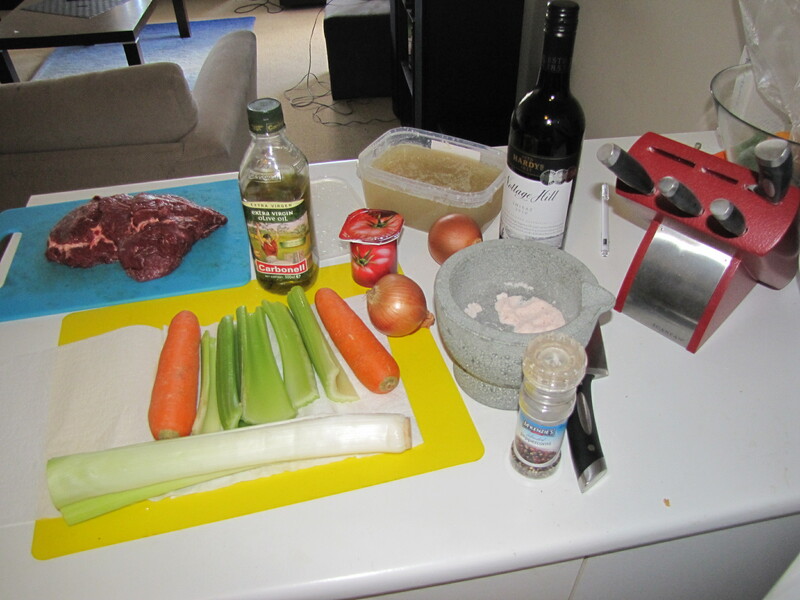 I settled on a Red Wine Braised Beef Cheeks recipe, bought the ingredients and a new dinner for that night (involving some chicken breasts and a new Spicy Portuguese Sauce from the guys at The Butcher and the Chef. It was super delicious!) and headed home. A fresh Sydney Saturday morning rolled around and I set off to get a bottle of wine, thinking I had plenty of time, but also no one to share the meal with. I threw an invite out to my sister, but having a 6 month old with the same intermittent sleeping patterns I had as a young personal trainer meant timing may be an issue for them. Especially given the amount of time it had taken me to get the cheeks in the oven- I seriously underestimated the preparation time. Next time I’d be much more efficient I’m sure. In the end they committed and I soon had an apartment soaked with the rich aroma of tomato and red wine. This recipe involved: carrots, onion (again! ), a leek, garlic, celery, a small tub of tomato paste, a bottle of red wine, a litre of my homemade lamb stock and close to 4 hours of patience. With this I also made a Creamy Sweet Potato Mash, which is where Heston came in. His technique of peeling but keeping the skin to boil in milk (I used full fat cream) then adding the now flavoursome liquid to the mash was an awesome addition. 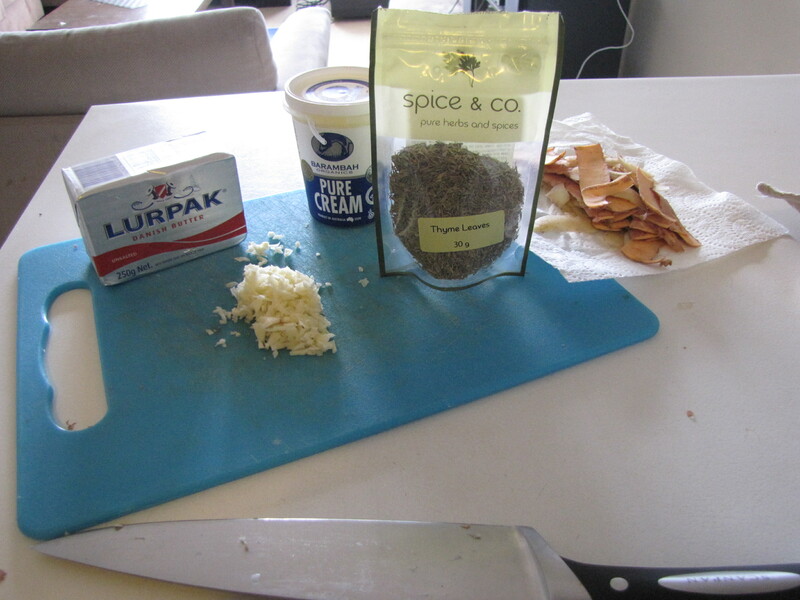 I also had butter, garlic and thyme in there leaving their own mark on the mash to come. At the 3 hour 30 minute mark I removed the cheeks from the oven, pulled back the foil and immediately panicked. They had shrunk. Considerably. And there was what I would call very little liquid left. I couldn’t figure this out. The dish was that full when I put it in I must have looked like I was in slow motion lifting it from the stove top to the oven, keeping my back completely upright and bending at the knees so as not to rock the dish and spill stocky, winey liquid everywhere. So at this point I’m baffled, but add more wine and some water, stir and put back in for 10 minutes while the mash is coming together and my guests are arriving. Once KT, CT and bub were in, I dished the mash, added some cheek and the flavour locked veggies as a side and we ventured to my toasty sun soaked balcony to chew on what was once doing much chewing of its own. I’m not sure how I missed it earlier but the smell of this dish, and most of the ingredients, was very close to a dish I’ve done with lamb shanks, which I loved. And this was no different- the meat was absolutely fall apart tender. It had entirely soaked up the flavours of the veggies, tomato, wine and stock, in addition a light and creamy but utterly tasty mash, and this dish was well and truly worth the wait! Heston would surely be proud. In some confusion with the dishing and photo taking, my sis grabbed one of the large portions and I ended up with the small one (her one). It wasn’t such a big deal to me as the richness of the dish left me more than satisfied while KT was ‘Xmas day full’. Groans and moans of ‘ooohh, I ate too much’ were met with reminders of how her eyes were clearly writing cheques her stomach just can’t cash. In the end a thoroughly enjoyed meal with family, always satisfying and rewarding. Would I do this dish again? Yes. Maybe another slightly different recipe, purely for interest sake, but slow cooked beef cheeks done well are simply beautiful. As a rating- I’ve had plenty of meats this year that would top it, but I still loved it, I just loved those more. Get some cheek on your tongue! What do you think? Anyone have an opinion on this dish and where the beef cheek sits in the world of meat? If so, please share. Have a look at the top of the page at ‘The Short Version’ to see, ah, the short version of this post. To all new readers- WELCOME and check out ‘What’s This All About’ and please feel free to ask questions, post comments and send me meat challenges. Want to see details of what training I do and how I stay lean and in shape? Keep an eye out for Thursday’s post, some interesting information on that coming out. Read it up. Pity i missed out on the cheeks , it looked amazing!! 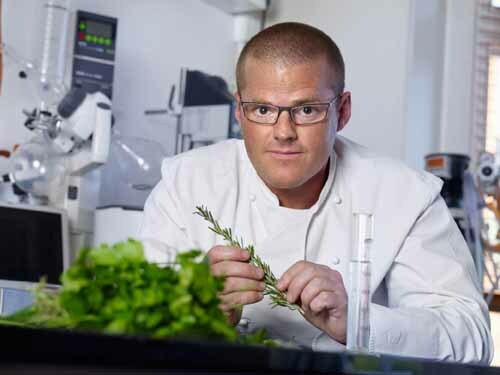 Observation: if Heston had a beard he would look like you and Craig – coincidence? or is he part of the missing Jewish boys club? Yes a lot safer than sheep’s brains on that front! Pretty easy if you just follow a recipe you like the look of.